A smartphone is required to change modes or configure manual settings. The number of images and time are guides only. The actual number differs according to the shooting conditions. Recording stops automatically if the internal temperature increases. Charge the battery by connecting it to a computer using the provided USB cable. The number of images that can be taken is a guide based on RICOH’s measurement method. The actual number differs according to usage conditions. Do not connect any device other than the 3D microphone TA-1 to the microphone terminal. 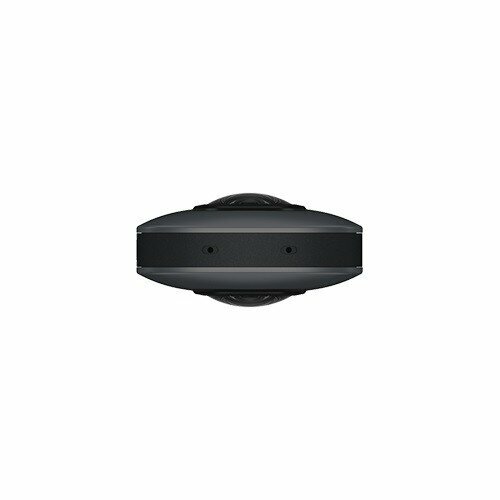 The Theta V 360° spherical camera is easy to use and compact enough to carry everywhere. A new image sensor and processor produces more realistic “as-if-you-were-there” 360° content. High-speed data transfer allows you to quickly and wirelessly upload 14 megapixel stills and high-resolution 4K videos for immediate showing and sharing. Omni-directional audio recording functionality enables 360° spatial audio. The camera can connect to a mobile device using either Bluetooth or wireless LAN to allow for flexible operation based on user preferences. In addition, the Theta V has a highly expandable operating system so that it can receive future performance enhancements through firmware updates. Record high-resolution, 360 degree still images equivalent to 14M output pixels. A completely new algorithm delivers low-noise, high-resolution, and high-quality images from low to high sensitivity. Two 1/2.3-type image sensors provide high-speed image data readout. An image sensor is included which delivers high-quality spherical video. The Qualcomm Snapdragon is used as a main processor. It delivers a variety of improvements including faster image processing and wireless transfer speed, and power saving capabilities. Four built-in microphones make it possible to record audio independently from four directions. This is then converted to a format that recreates natural 360° spatial audio. This is a four-direction, 360° spatial audio microphone designed specially for the THETA V. Use it to record even higher quality audio with a more realistic feel. The shutter speed can be set in a range from 1/25000 to 60 seconds. The minimum shooting interval is 4 seconds. This enables a greater range of use when creating time lapse videos. 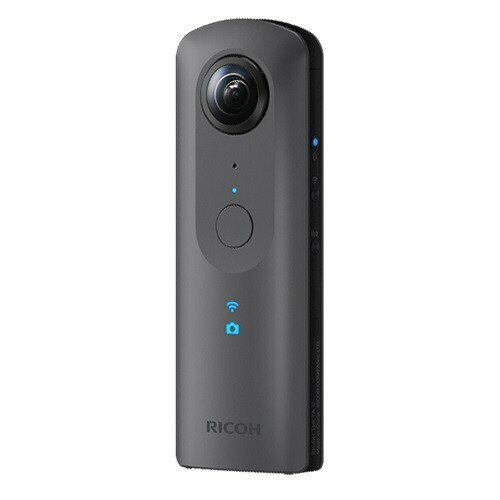 This model supports 4K compatible 360 degree live streaming. Output the 4K (3840x1920 pixels), 360 degree image in real-time. In addition to wireless LAN, Bluetooth is now adopted for constant connection4 to your smartphone. Enjoy instant remote shooting and change shooting settings wherever you are. Communication speed for both still images and videos is drastically improved. The maximum data transfer is approximately x2.56 faster than that of conventional models. A new system based on the Android OS is used on this mode. Adding plugins to the camera makes it possible to expand various features. Other devices are required, including the separate wireless display adapter. When sleep mode is activated. You can shut the camera off by holding the power button. Compatibility planned with firmware update. Compared to THETA S. Actual measured value of time required to transfer data to an iOS device with video data of the same size. According to Ricoh research. The Remote Playback function is a pre-installed plugin.